Scathing wit and the most unflattering self-pity vie for prominence in Simon Callow’s performed recitation of Oscar Wilde’s letter to his former lover, Bosie, penned in 1897 from Wilde’s cell in Reading Gaol, during the last months of his two year sentence for gross indecency. The letter, as adapted by Frank McGuinness for the stage, reveals Wilde’s relationship with Bosie as an act of almost negligent self-harm, an infatuation that he gladly allowed to cut into his fortune, his family life and most of all, his creativity. Raging and clear by turns, it itemises Bosie’s faults, outlining his failings in the most cutting of manners, yet is yearning for his approval, promising to forgive if only he will write to Wilde. 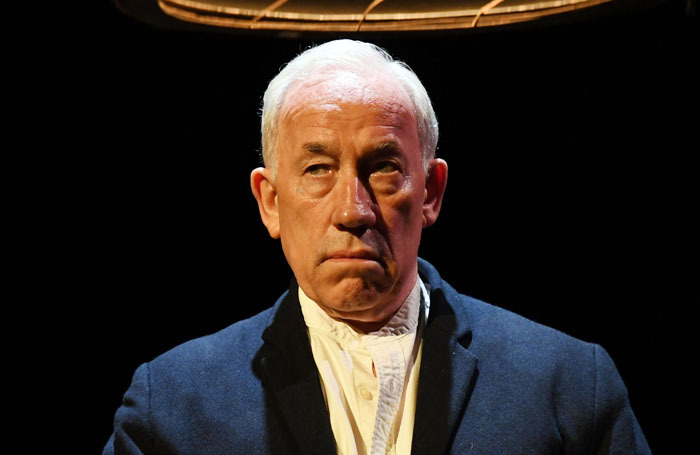 Seated on an empty, darkened stage under an ironwork light, Callow sets about this shrill cry of conflicted anger and longing in the most satisfying of manners. The early pages role out easily, Callow’s emphasis lifting the meaning. An 80-minute monologue is a huge task all round and director Mark Rosenblatt ensures that there is just enough movement to keep the attention. But as Callow gets to the grit of the letter, his delivery becomes more jumpy and doesn’t enhance the nuance of the writing as much, making the whole thing rather more impressive than revelatory.